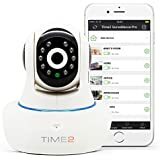 From the Time2 Classic Range the 720p HD Wireless IP Home Security Camera keeps you connected with your home at any time. It's flexible, allowing you to rotate the IP camera to whatever position you need using your finger via the smartphone app. View live stream, record and receive instant alerts when motion or audio detected. View all recordings on your phone. No monthly data storage costs. 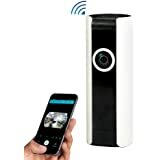 With simple and easy setup your home security camera will be ready to use within minutes. 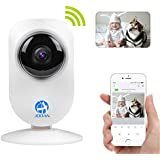 From the Time2 Classic Range this is an easy to set up indoor surveillance camera, rotating a full 355 degrees and tilts all the way through 90 degrees giving you an all round live view in 720p HD with playback on your iOS or Android smartphone. 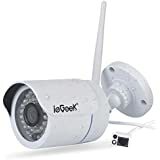 Automatically switches to infrared night vision when it gets dark, receive alerts to your phone whenever the motion or sound detector is triggered. Use with one or more Time2 Classic Cameras to create an indoor CCTV system throughout your home. Download the free Time2 App from the iOS Appstore or Google Playstore to connect and view your Time2 cameras. 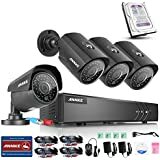 Add as many cameras as required and view up to 4 cameras at the same time. Share with family members so they can see what you're seeing. Receive alerts to your phone whenever the motion or sound detector is triggered and automatically switches to infrared night vision when it gets dark. Use with one or more Oscar cameras to provide full coverage home security directly to your smartphone in real-time.